Application: Suitable for 1/4" DIN 3126-C 6,3 und E 6,3 (ISO 1173) hexagon insert bits and Wera Series 1 and 4. Design: Rapidaptor rapid-in, rapid-out, rapid-spin, chuck-all, and single-hand technology, with strong permanent magnet. Drive: 1/4'' hexagon suitable for power tools with DIN 3126-F 6,3, ISO 1173 receiver. The free-turning sleeve allows screw steadying at the start of the screwdriving process. 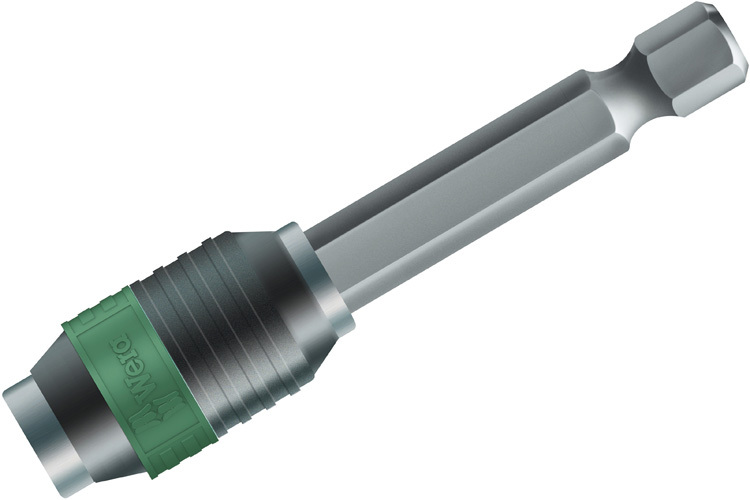 Wera developed the Rapidaptor that allows rapid bit change without any extra tools with only one hand. The 05052503001 Wera 889/4/1 Rapidaptor Universal Bit Holder is one of thousands of quality tooling products available from MRO Tools. Please browse Wera Rapidaptor Bit Holders for tools similar to the 05052503001 Wera 889/4/1 Rapidaptor Universal Bit Holder. 05052503001 Wera 889/4/1 Rapidaptor Universal Bit Holder description summary: Wera 889/4/1 Rapidaptor Universal Bit Holder: Hex Opening: 1/4'' Drive End: 1/4'' Hex Diameter: 15.0mm Overall Length: 75mm / 3'' Quantity discounts may be available for the 05052503001 Wera 889/4/1 Rapidaptor Universal Bit Holder. Please contact MRO Tools for details.